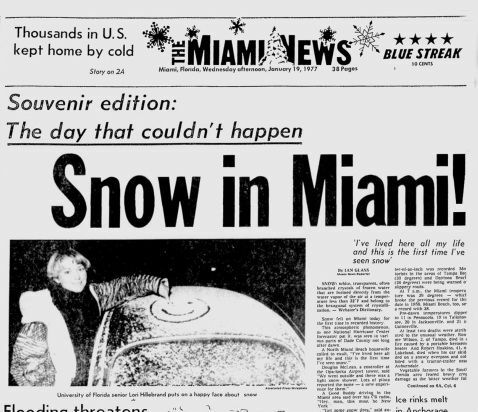 On January 19,1977 it snowed in South Florida? It was the first time on record that snow had fallen in the South east Florida from West Palm Beach to Broward County and South across Miami, Dade. Can you believe it? Snow in Miami. Of course it did not last long. The snow melted as soon as it touched the ground. According to forecasters, the farthest snow had ever reached before this time was in 1899 along the lines from Fort Myers to Fort Pierce. WHAT WEATHER CONDITIONS CAUSES SNOW? Snow is formed when temperatures is low(0 degrees Celsius or 32 degrees Fahrenheit) is moisture in the atmosphere in the form of tiny ice crystals. When the tiny ice crystals collide they stick together in clouds and become snowflakes. If the snow is below freezing, the snow will reach the ground. It does not feel cold when it snows, unless you are a Floridian. The most heavy snowfalls occur when there is relatively warm air near the ground-typically 9 degrees Celsius or 15 degrees Fahrenheit or warmer. Since warmer air holds more water vapor.